A while back, we posted this question on Facebook and got back over 60 comments with a great list of marketing speakers. 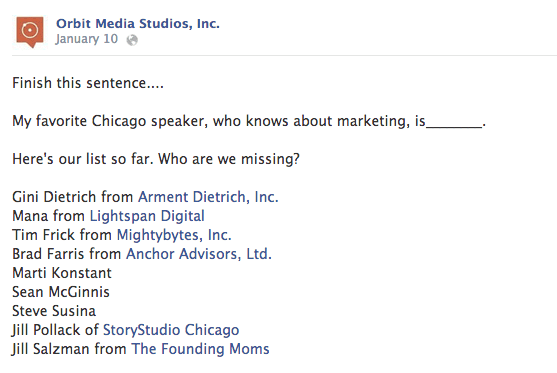 From that one Facebook post, we were able to come up with a list of Chicago marketing speakers. Sweet! Do you know the marketing speakers on this list? You can vote up or down anyone from the list, vote yourself in, or leave a comment to add someone. My other motivation behind this, is that we have Content Jam, a two-day content marketing event, fast approaching and this will help us when considering speakers for the event. 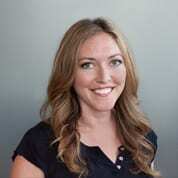 Don’t forget about Dan Gershenson at Caliber and Stephanie Walters of Blue Top Marketing! Totally love this post. Of the people I know, on the list, it is like ranking of the smartest and wittiest people in Chicago. Rob Biesenbach is really good! Nancy Goldstein of Compass (x) Strategy should definitely be on this list. Always love hearing her marketing insights. Carter doesn’t just know his stuff … he’s an entertaining speaker too. I vote for Brian Burkhart of Square Planet. Brian Burkhart of Square Planet!! Awesome list! Some of the best and brightest of Chicago. My vote goes to Mr. Crestodina! My favourite Chicago speaker, who knows about marketing, is David J.P. Fisher. My favorite Chicago speaker regarding Marketing issues is David J.P. Fisher. He always has something new and relevant, Keeps us on our toes.